The Raspberry Pi User Guide: 2nd Edition contains everything the reader needs to know to get up and running on the Raspberry Pi. 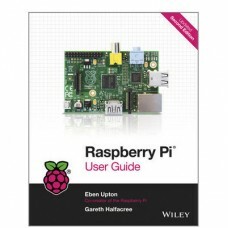 Written by Gareth Halfacree and Eben Upton, the co-creator of Raspberry Pi, the book shows how to: Connect the Raspberry Pi to other devices -- keyboard, mouse, monitor Install the necessary software Learn basic Linux System Admin in order to understand files systems etc. Configure the Raspberry Pi Set-up the Raspberry Pi as a simple Productivity computer Set-up Raspberry Pi as a web server Write basic programs in Scratch and Python Create simple hardware projects Set up the Raspberry Pi to drive a multimedia center Raspberry Pi User Guide is an ideal companion when starting out using the Raspberry Pi board. The Raspberry Pi® is a single-board computer developed in the UK by the Raspberry Pi Foundation with the intention of stimulating the teaching of basic computer science in schools. The design is based on a Broadcom BCM2835 system on a chip (SoC), which includes an ARM1176JZF-S 700 MHz processor, VideoCore IV GPU, and 256 megabytes of RAM. The design does not include a built-in hard disk or solid-state drive, instead relying on an SD card for booting and long-term storage - Wikipedia. Be sure to check out our posts, tutorials and new Raspberry Pi related products. Have you tried the new "Adafruit Raspberry Pi Educational Linux Distro" ? It's our tweaked distribution for teaching electronics using the Raspberry Pi. Raspberry Pi® and logo are trademarks of the Raspberry Pi Foundation.